When Reine Baldwin meets a charming journalist during a freak  blizzard, she has no idea her carefully crafted life is about to fall apart. But a break-in to her office, a flood in her classroom, and the discovery of a lost portrait lead the reclusive art historian back to where everything started hundreds of years earlier. Returning to Venice on the eve of Carnevale makes Reine face a past she's inexplicably forgotten, including a man who - just like her - should be long dead. Suddenly, the young woman has the chance to trade her quirky sock collection, musty libraries, and an ordinary life with any mortal she'd surely outlive for the man who's apparently loved her for half a millennium. The choice should be easy, until Reine starts to remember things others wish to remain buried. 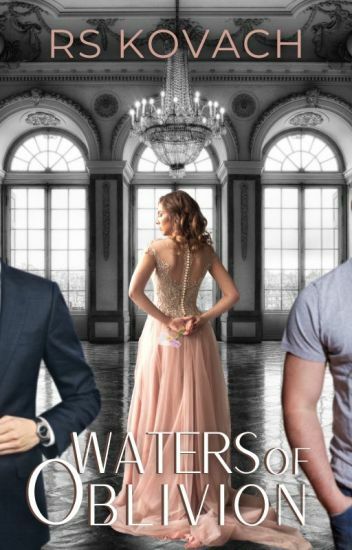 WATERS OF OBLIVION is a New Adult paranormal romantic suspense in the vein of A DISCOVERY OF WITCHES meets JULIET IMMORTAL. The Beloved: Waters of Oblivion/Gods of Sorrow © 2009-14 by R.S. Kovach All rights reserved. No part of this work may be reproduced without the author's written permission. The year is 1955, and the death of beloved high school junior Sarah Benadine has left the town of Clearwater, Wisconsin reeling. It seems everyone in town has their own suspicions on what happened to the girl. But when Sarah's eleven-year-old neighbor, Shannon, is attacked by an unknown creature in the night, it becomes evident that things are not quite what they seem. Shannon is invited to attend the prestigious school on the outskirts of town and is suddenly swept into a whole new world she is only beginning to understand. As more bad things begin to plague the town of Clearwater, the question everyone wants answered is: What really happened to Sarah Benadine? Freddie kissed him again. He groaned and pressed into it. Deepened it immediately, kissing her so hard, she thought he might draw blood. But then he was pulling away. Backing away three steps, and freezing, miserable air rushed between them. "You're dangerous." He ran a hand through his hair. A tiny frown knit his brow. "So, so dangerous, Freddie Gellar." From New York Times bestselling author Susan Dennard comes a story packed with steamy romance, epic best friendship, and a dark mystery that dates back centuries. The Executioners Three is Stranger Things meets the legend of Sleepy Hollow in 1999 on the shores of Lake Michigan. After high school senior Freddie Gellar finds a body in the woods, she sets out to prove it wasn't a suicide like the sheriff ruled. But then more bodies start piling up -- and if that's not creepy enough, supernatural warning signs from the old poem "The Executioners Three" start unfolding too. To complicate things even more, Freddie gets roped into a rivalry between her high school and the local prep school. For twenty years, the two student bodies have pranked each other, and the enmity between them is vicious. Except that over the course of all these back-and-forth pranks, Freddie finds herself falling for the #1 enemy of them all: Theo Porter. New chapters every Wednesday and Friday! Rosie Grey was only seven years old when she arrived at Mr Thompson's cotton factory. Now fourteen, she has become accustomed to the treatment of the workers and the harsh conditions under which they are forced to work. After an accident in the storeroom leads to her dismissal, Rosie must try to make her own way in the real world, away from the life she had grown used to. But despite being seemingly free from her life at the factory, Rosie struggles with the dark past that holds her captive, and she doesn't know if she will ever be able to escape the life she tries so hard to forget. Nearly a year after his father's death, life is almost back to normal for Timmy Manson and his mother. Timmy has almost no problem sleeping anymore. His new imaginary friend, Mr. Easybreeze, is always around to go on adventures with him. And on top of all of that, he'll be starting first grade soon. His mother isn't all the way back, though, as the death of her husband has left her with lingering anxiety. So one day, when she's not paying attention, Timmy wanders too far off into the forest. When he comes out, he finds that night is falling... and his mother is gone. Now, Timmy has to find his way home, armed with little more than his flashlight, the bucket he wears as a helmet, and the blanket he wears as a cape. Mr. Easybreeze is scared, though. For The Monster is coming for Timmy, and it won't stop until he finds his way home. Copyright © 2017 by Wyatt Richards. All rights reserved. Cover art created by @DeekshaAdurty. Prohibition is the law of the land, but taxi dancer Nellie Sypek needs cash. An argument ended with a gangster getting socked in the face, and she's got ten days to make it right by way of five hundred bucks. Caught empty-handed and frightened of the gang's reputation, Nellie decides to turn bootlegger. She accepts a job from her sly friend Lola to pick up some liquor. It should be a cinch, seeing as how Nellie's dependable mechanic friend Felix volunteers to help drive her car. But an encounter at a speakeasy sends idealistic cop Lester on the chase - and he's not exactly looking for cash. As tensions between Chicago lawmen and gangs grow worse by the day, all the fast talking in the world might not be enough to keep Nellie and her friends out of jail. Or alive. Felix drums his fingers along the steering wheel. A man exits the other car, dressed to the nines with a fine-looking fedora. A very bad feeling begins to swirl inside my chest. He's certainly no cop. The attendant is hurrying with the pump. Felix has tensed beside me, staring with fascination directly ahead. Felix presses his lips together. But he knows we can't leave. We need the gas. Felix has a back-up can of it stowed somewhere but that's for emergencies. Is this a real emergency? One of the other fellas hops out. Before the door slams I notice what his still-seated friend is holding. My skin prickles. Felix pales. We're just playing at bootlegging now. But those folks are the real deal-complete with hired guns to protect their hooch. Felix's hand moves to the starter and I knock it away. The one in the fedora has seen us. He casually makes his way over and I know our story isn't good enough; this guy will notice we snooped even when we didn't mean to and we'll be in some sort of a mess. So I ditch our story. I throw myself at Felix and kiss him as thoroughly as I know how. Set in Shanghai, China, the home of the world's largest cryptocurrency trading platform and the 6th largest cryptocurrency in the world, the novel Bitcoin Clowns tells the story of a young, talented programmer Jong He who plunged into the mysterious and dark world of cryptocurrency and blockchain technologies because of a pet cryptocurrency he created as a joke to mock the ICO speculative madness happening around the world. Little did he know his invention would be quickly adopted and became the latest fad of the town, got backed by international banks, helped create the world's first cryptocurrency Billionaire, and even attracted adoption from a slew of criminals including South American counterfeit drug cartel and anonymous Eurasian hackers slash Robbin-hoods. In the meantime, his cousin Cao had disappeared because of financial troubles at his company that sold ill-designed cryptocurrency funds of debatable legitimacy and his partner was found dead in the office after a client lost a huge amount of investments passing through their hands. His cousin's other sketchy business partners were reluctant to tell him anything and law-enforcement was grossly unfamiliar with these new kinds of financial instruments to see through the thick plot of deception in front of them. Jong had to rely on his exceptional luck, incredible courage and loyalties of his friends once again to find his cousin and retrieve the missing millions. Could Jong succeed, or would he be sacrificed and fade into obscurity in the latest, fiercest fight of the century on the digital realm for the kind of new digital gold and the power to control key businesses and even governments around the world? [Wattpad Picks: Editor's Choice] A research team dedicated to advanced medical care is in the process of creating a bandage that seals and heals all injuries almost instantaneously. The catch? The bandage itself is a living organism that burrows inside of you. When the team's attempt to breed a new version of their bandage produces something unexpected, they go underground to protect their research. Now, they are on the hunt--for answers, for investors...and for test subjects. Pearl is a fast-paced thriller with a dash of mystery that will develop into an action sci-fi/fantasy novel as it progresses. It contains scenes of gore, body horror, and some violence. Proceed with caution, and dive into the world of illegal research where morals are optional and curiosity turns to obsession. Wake. Force myself out of bed. Stress. Class. Homework. Breakdown. Sleep. The routine is what got Sidney through life, even though sometimes the stress was just amplified by her other stress. It wasn't her best life, but she was going to try and make things better for herself. Happiness was something she wanted once again and was sure she'd get. Then her paranoia gets to her, but now someone is actually creeping on her and she's confused as to why. As it gets worse in swoops Samuel, the ex-boyfriend she'd hurt and whom she hadn't spoken to in over a year. Sam has some information to shares a secret he was hiding from her and verifies that someone seems to be after her. Now there are some more things added to her new life schedule and she has to navigate those too. What if an algorithm controls your life? In the near future, California is plagued by civil riots. Exploding rent, high crime, and political corruption threaten the lives of ordinary people. Enter Crowd, an advanced social network that ranks each citizen by their contribution to society, ensuring justice for all. Want affordable healthcare or better employment? If you rank high enough, you can get it. With California on the brink of civil war, Rain has to discover whether Crowd is the solution or a problem. Inspired by Black Mirror, The Circle, and The Social Network, Crowd is a pre-dystopian thriller. Born with a damaged heart, Leanna Weston has lived a sheltered life with little chance at adventure. When she hears that Finvarra's Circus is coming to her small town, she sneaks off to witness the magic first hand,  sure that this is her only chance at experiencing true magic-even if the frightening rumors about the heartless Ringmaster, Finvarra, are true. Caught by Finvarra, Leanna is given one chance at survival: she must join the circus. As slowly she becomes part of the strange family, Leanna learns that there is more than magic to this circus, but an ancient curse that has tied Finvarra's life to its rings. If the circus fails, he dies. Leanna vows to save the circus, but when a ruthless enemy emerges, set on destroying it and Finvarra, will Leanna be able to save them both, or will her broken heart fail her just when she needs it most?